Well the soon to be former Governor Eliot Spitzer’s limousine brigade is stuck in traffic (and the networks are giving him the OJ Simpson treatment, with helicopters flying overhead showing his slow-motion progress through Manhattan traffic), so let’s take a few moments to reflect on the shabby legacy of the financial press when it comes to Spitzer. This morning Kimberly Strassel points out on the editorial pages of the Wall Street Journal that Spitzer played the press like a Stradivarius. (Bess Levin would surely have come up with a much more apt and colorful description.) Many reporters built careers on the prosecutor&apos;s leaks intended to bully innocent people, Strassel explained. Yet from the start, the press corps acted as an adjunct of Spitzer power, rather than a skeptic of it. Many journalists get into this business because they want to see wrongs righted. Mr. Spitzer portrayed himself as the moral avenger. He was the slayer of the big guy, the fat cat, the Wall Street titan -- all allegedly on behalf of the little guy. The press ate it up, and came back for more. She details the instances of his bully-boy tactics, smearing opponents from behind the scenes with the financial press all to eager to repeat his attacks. The worst seems to be his attack on John Whitehead, a respected Wall Street figure who has never been publicly accused of wrong doing but who had the temerity to defend Spitzer target Ace Greenberg. Spitzer called him on the phone to threaten him, and when Whitehead publicized Spitzer’s threats, the press suddenly got calls hinting at corrupt connections between Whitehead and Greenberg. 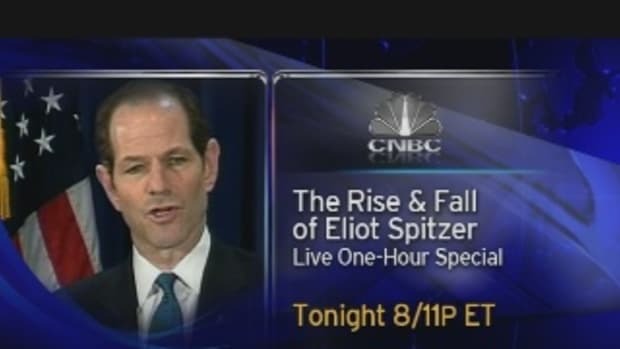 We covered the press enabling Spitzer’s slimy tactics long ago. It’s nice to see this issue getting more attention.